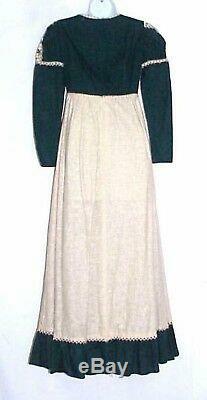 VINTAGE 1960'S 1970's GUNNE SAX by JESSICA. 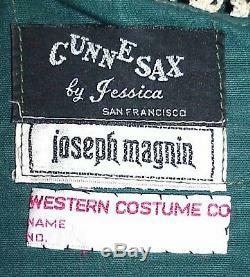 BLACK LABEL / JOSEPH MAGNIN LABEL / WESTERN COSTUME COMPANY LABEL. 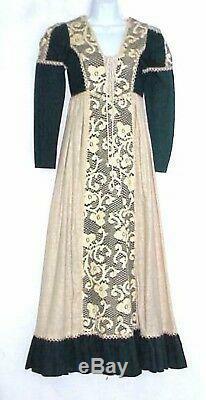 MAXI DRESS VINTAGE RENAISSANCE BOHO HIPPIE - MOVIE WORN. WE SPECIALIZE IN OLDER VINTAGE MOVIE WARDROBE AND HAVE THOUSANDS OF REAL MOVIE WORN ITEMS IN CURRENT INVENTORY! This is a fabulous vintage dress we are offering! 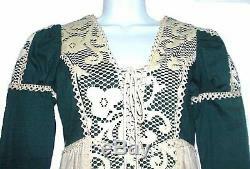 This is a GUNNE SAX by JESSICA original. The dress not only has the original BLACK LABEL, it also has a JOSEPH MAGNIN label and also a WESTERN COSTUME COMPANY label! The dress is done in deep green and ivory / cream. This maxi dress has a V'd neckline with the bodice and sleeves done in the deep green with ivory / cream lace down the center front. The skirt is done in the ivory / cream woven material with a deep green ruffle around the hem. 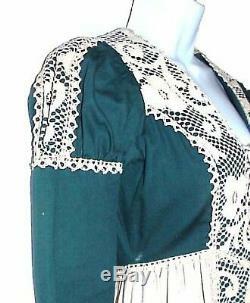 The center front of the skirt has a center panel of the deep green with the lace over it continuing from the bodice down to the hem. The dress laces up at center bust. 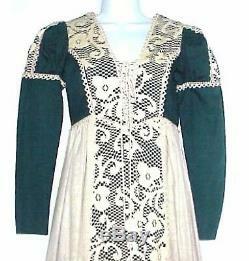 The long sleeves are done in the deep green and have a puffy upper sleeve (medieval style). The puffy part has the ivory lace over the top vertically and a small row of lace horizontal around the bottom of the puffy part. This fabulous vintage dress fastens in back with a zipper. The measurements are APPROXIMATELY a 34" bust, 26" under the bust and 14 across the back shoulders. Please keep in mind the age of this outfit! This is a beautiful collectible and needs to be seen to be appreciated. 99% of the time, with good communications almost any problem can be solved. Please keep in mind we sell Hollywood Wardrobe that is collectable. Please remember Communication is EVERYTHING because we will bend over backwards to help our valued customers. The item "VINTAGE GUNNE SAX by JESSICA BLACK LABEL JOSEPH MAGNIN DRESS WESTERN COSTUME CO" is in sale since Thursday, June 26, 2014. This item is in the category "Entertainment Memorabilia\Movie Memorabilia\Wardrobe\Originals".